After our work with Dennis, Bobby and I were highly inspired, encouraged and excited about learning more. We use TTouch and the other training methods daily. My husband Steve cannot believe the transformation that has occurred and our friends and family have commented on how wonderful Bobby is to be around. Bobby sits up and bats his eyes at all of the compliments he receives. You working with Brianna was so kind and taught her (and myself), so much. It really cleared things up for her. She used to cry and get upset when Gambit would get hyper and upset….she now just kind of engulfs him in a nice quiet calm. And the results are amazing! Dear Dennis, I can't thank you enough for the difference that has been achieved in Marley's behavior due to your training. Everyday used to be a struggle to get the lab to calm down and not be out of control. Now, Marley is comfortable in his own skin. I can take him for a walk without him pulling on his leash. He no longer bolts the door to get outside and he didn't jump on a visitor for the first time! He wouldn't let me touch his front legs, but I can now brush him all over and he looks forward to it. Your handouts and music have all been instrumental in given additional support to the training sessions. You have been available by phone and have always thought of the happiness of the dog (which contributes to my happiness) in your recommendations. I highly recommend you as a professional dog trainer and would love to be used as a reference, if you like. has been fearful since she was 5 months old and is now finally making progress towards becoming a balanced and more confident dog. For the first time since she was a puppy I can take Aspen in public without her shaking uncontrollably if she is wearing the Thunder Shirt. Dear Dennis, I wanted to write you a note and let you know how much I appreciate you and the classes that I have taken through Friends for Life Dog Training. I got Finn a couple years ago to be a companion to my Husky who was not recovering well from the loss of my other dog. Finn was a couple years old, had lots of energy and was very aggressive on the leash. I took him to several other dog obedience courses and was not able to get him under control. I was frustrated and feeling incapable of handling him. Then I found out about the class you were offering for dogs with aggression problems. I signed up. The first day I came I felt a sense of relief and knew that I was going to get the help I needed. Over the course of several months, through your expertise and sincere caring and compassion for animals and people I have learned positive skills to manage my dog. The process not only has changed my relationship with Finn but given me opportunities to go places and do things with my dog I did not think were possible. I am sincerely grateful for the extra time and consideration that you have given to me and my Finny. The classes that I took and continue to take have been fun, interesting and extremely helpful. I appreciate the sense of community that you create and sensitivity and attention to individual needs and goals. I cannot speak highly enough of my experience with you and your training. I am impressed by your knowledge and love how you make classes fun and interesting. Finn and I thoroughly enjoy coming to class each week and look forward to learning new skills and having fun. See you soon. I adopted Jager, my black lab, about 8 or so months before taking him to see Dennis. It had been some trying times as he was my first large and rambunctious dog, and I chose to enroll in a Basic Manners class because I felt that anything where he and I worked together would help our bond grow. He had many issues I wanted to work on, but the underlying one was that he didn’t seem to listen to me and this permeated our entire relationship. After 8 classes with Dennis, it is amazing how much he has transformed. He’s not perfect of course, but he’s as close to it as I think he’s going to get. Dennis taught me the skills I neede—as an inexperienced dog owner—to find a way to communicate successfully with Jager and without using punishment, fear or physically aggressive techniques to do so. Though his selective listening was my biggest concern, we also worked on some skills that have proved extremely useful. It is SO nice to have a dog I can take to the coast or hiking in the woods and let him off leash, knowing he will actually come back when called! Also, working on his leash walking has made walks around town much more pleasant, and learning how to teach Jager some necessary social skills like patience and rewarding him for his good behavior around other canines has proved invaluable. Jager and I both thank Dennis from the bottom of our human and canine hearts for his time and dedication to his work that has helped cultivate our relationship from one of ongoing frustration, (probably on both our parts), to a more balanced one with mutual respect and affection. Before we worked with Dennis I think I felt Jager was a bit of a burden, even if I wouldn't admit it, but now I can say it is truly a pleasure to be a dog owner! Friends for life dog training and it's owner, Dennis Fehling has provided the best dog training I have ever Experienced. I am training my third dog and the first adopted adult dog. She came to me having never been socialized as a puppy and at two years old was afraid of other people and animals. In one month of training with Dennis, she was wagging her tail at strangers, greeting other dogs without being afraid: a much more confident dog. After five months of classes with Friends for life dog training, she passed her Canine Good Citizens class!! We continue to take classes from Dennis and recommend his training school to everyone we know with a dog. Thanks Dennis!! Kendyl Hanning and Mr Tug Bailey. I came to Dennis for help with my reactive border collie, on the recommendation of a fellow agility student. I had gotten my dog as a trail riding buddy, as well as for agility. As he matured he would lunge, bark, and try to bite the legs of my horses. This reaction also happened in the car with motorcycles, joggers, bikers, etc. I was afraid for his life if I did not do something about this. Dennis immediately impressed me at our first meeting by thoroughly interviewing me, and interacting and observing my dog. He shared his significant knowledge, tips, and support, but most importantly he was genuinely interested in helping my dog and I succeed. Every training session we have had has been an improvement to my timing and handling skills, and my dog is learning how to cope with his triggers. He is a calmer, more confident dog. By showing him other ways of dealing with his stress that are acceptable behaviors (sniffing, digging, or simply walking away) I believe THAT is training. You are your dogs advocate. Do the work! We highly recommend Dennis and Friends for Life Dog Training to anyone wanting basic, advanced, or issue related dog training. We had some real concerns with our much loved adolescent male and Dennis helped us to work through them with patience, caring, studied and natural expertise. One month after we started working with Dennis issues were resolving and it was a night and day difference! He always approached our work together from a place of non-judgment and compassion and took the time to really understand the issues, us and our dog and then develop an approach that would best meet our needs adapting along the way for the best outcome. His commitment to positive based training was important to us and so respectful of the human-canine bond. We had felt that we were pretty knowledgeable about dogs but our previous experience was not helping us in our current situation. We learned so much and have changed our approach considerably in our ongoing work with our furry boy. We only wish that we had started out with Dennis when Auggie was a puppy. The level of value for dollars spent that Dennis provides is quite high. He is organized in his approach, thorough in his direction – always following up with carefully written summaries and reminders after each session and attentive to ongoing questions or concerns including providing compassionate emotional support along the way! I just can’t say enough about the gifts he brings to his work. We have now started working with Pam as well doing nose work with Auggie and are so pleased with her and her classes as well. Her classes are organized and easy to participate in. She adapts for the individuality of the different dogs in the class so all are successful and the class still flows well. Thank you Dennis and Pam for what you do! It is clear you love what you do and we love that we get to benefit from your work! Lois and Paul Vallerga Bend Oregon. Rose, Hi Dennis: Rose and I – and of course Maggie - wanted to thank you again for a great experience in your Basic Manners class. We loved your enthusiasm and your attitude about dogs and how to train and interact with them. The class not only helped us train Maggie, but to bond with her as well. We really learned a lot, and most importantly, they’re lessons that can be used everyday, in real-world situations. I mentioned that we deal periodically with Golden Bond Rescue. They’re located in the Portland area, so they know trainers over there, but don’t know good trainers over in this area that they can feel comfortable recommending to their foster families and new adopters on this side of the mountain. When they heard we were taking a class from you, one of their senior adoption coordinators asked if we’d report back on our impressions of the class. I wanted to share with you what I told them: I wanted to take a moment to follow up with you concerning the dog training. We loved getting our whole family involved with learning how to give our dog an awesome life with lots of love! We highly recommend ANY training and classes. Friends for Life Dog Training is the best! I highly recommend all of their classes. Dennis and Pam (plus all of their assistants!) are so patient, passionate about dogs and training and are an incredible wealth of information. Their positive approach to training is SO awesome. We attended puppy class and basic manners with our new Bernese Mountain dog and he is doing great! These folks truly care about your animal. They treat them as your own child. Very patient and understanding with dogs. A full recommendation from me. Thank you for saving my life!!! Tommy Imholdt Battle Buddy Student. Friends for Life dog training was instrumental in getting Rosie and I off to a fantastic start. I learned about how dogs learn; how dogs view the world; and canine body language. This helped me understand Rosie’s world from her point of view and really helped me communicate with her. I wanted to share with you what happen the other night with Lemon. I went out to feed my horses, later then I normally do so it was very dark. I never carry a flash light or headlamp because there is a light in the barn. And I'm trying to tell myself I'm not scared of the dark the way I was when I was a child. Anyways, while I feed, Lemon runs around eating all the horse poop she can. I never worry because she has a very good recall. As I'm diligently break up hay flakes I hear Lemon bark. Now this is unusual. Lemon is not vocal unless she is unsure of a situation. The next thing I hear is jingling of tags on a dog's collar. Lemon doesn't wear a collar at home. It must be the neighbors dogs, which I know little about other than they travel in a pack of 3 to 4. I immediately freak out. I shoot out of the barn into the blackest of night, to find nothing -because I don't have a freaking flashlight! The neighbors dogs are definitely on our property because one starts to bark at me. I have no clue where Lemon is, all I can hear is barking and dog paws dancing on the ground. At this point I'm about really to scream Lemon's name while swinging a pick fork near the noise. Fortunately better judgment grabs ahold of me and reminds me of all our training. Instead of crazy, I simply holler "Lemon touch". Within a few seconds I feel a wet nose on my hand. Yep I carry treats and she got all of them! It may not sound earth shattering, but that moment of not knowing where Lemon was or what was happening was extremely scary. It's reassuring to feel that even in a less than ideal situation, Lemon will use her brain and do what she has been taught. So thank you Friends for life dog training. I know without the amazing foundation we received through your classes, this story could have had a very different ending. When I first got Koda, and 18 month old German Shepherd, he’d had very little training or exercise. I found out quick that he is an extremely intelligent, high energy dog. It seemed at first that all my work with him was falling on deaf ears. I took him for a long hike every day to wear off his energy. Within a few weeks of taking Dennis’s class in Basic Manners Koda started to blossom. He went from a dog that drug me til my hands were red to leading quietly on a loose leash. He has always been over interested in other dogs and pulled on the leash to get to them. Now the “This way” command gets his attention and he forgets the dog. He’s learned to not chase chickens or livestock with the simple and positive training commands. I’m forever grateful for Dennis’s training methods and for him telling me about this beautiful German Shepherd that needed a home. Koda has turned into an incredible dog. Dennis performed a miracle with our dogs. We were told there was little hope that our dogs would ever get along by a highly recommended animal behaviorist. Dennis and Pam showed our girls that they could trust each other again and live out their days with us. We are forever grateful!!! Heidi Rather and Family and their dogs Daisy and Lilly. I highly recommend Friends For Life Dog Training! I can tell the advice that Dennis and his team gives, comes from a long history of experience with so many dogs, and true love for the canine species. Before I signed up for classes Dennis took the time to ask me questions about my pup and he's always answered my questions with helpful advice. We've been to four training classes with my labrador puppy and will continue to take group classes or private training as needed. We've had so many good lessons from attending the classes. 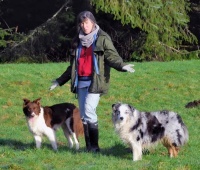 There is so much conflicting information about dog training on the internet and it's good to have a trustworthy teacher to rely on for advice. All of the things we've learned with Friends for Life are consistent and really make sense. As we've entered the puppy teenager phase, I'm noticing better behavior and I'm able to establish good habits, though my puppy's energy level, and needs are changing. We're looking forward to more success with our pup as he grows thanks to this team. I have a lot of gratitude to Friends for Life and I highly recommend them!